There is beauty in a traveler with no camera. Too much time behind the lense is too much time actually living that’s been lost. As a parent and collector of very little other than photos, though, I enjoy capturing the exact spot that my children are growing up around the world. By learning to pull a sort of Smith & Wesson quick draw, never quite stopping for the picture or allowing it to disrupt what you were previously doing anyway, well, there isn’t much that a camera cowboy can’t do down here in Old Mexico. May, 2016, Guanajuato Mexico is full of streetperformers, from jugglers at stop lights to mariachi bands in restaurants, and Guanajuato is no different with its plethora of livingstatues. Except, they tend to move. A lot. This guy in the background scared the bejesus out of our youngest when he broke formation and mimed a selfie as we tossed him some dinero. 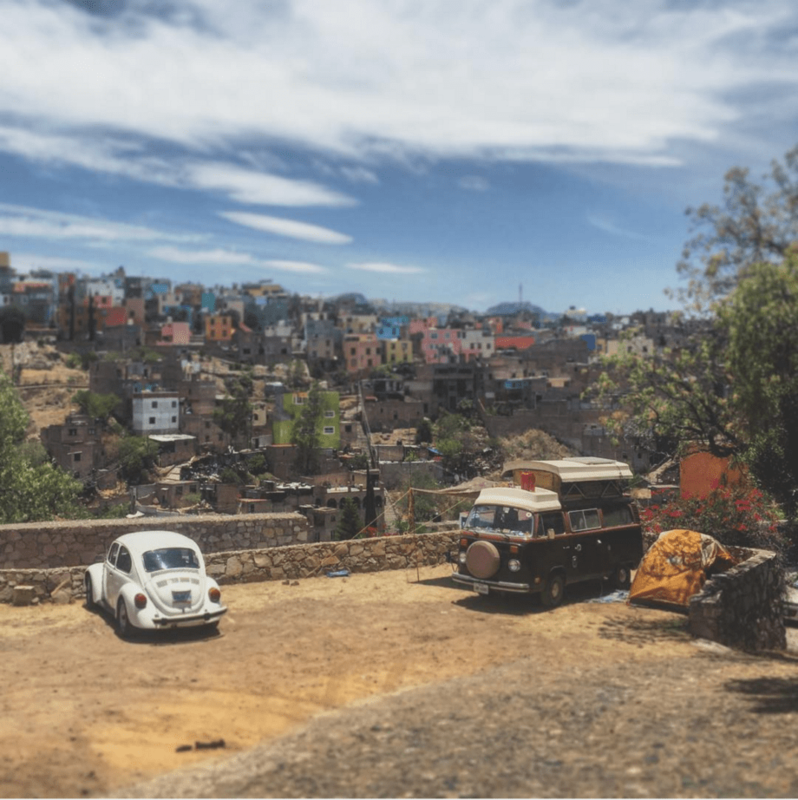 May, 2016, Guanajuato Like a house of UNO cards, Guanajuato lives in every possible space that could be filled as one can imagine a booming silver town desperate to provide residence for miners and those making the real money alike. This pile up of houses, the winding streets of cobblestone, the smell of sewage mixing with cinnamon and pizza, the multitude of “buenas tardes” offered at nearly every passing face (particularly the abuelas who I fear will steal our children if we don’t keep their cheeks out of reach)…it’s all a dream to me and everything I’d hoped for when I first saw pictures of this city a few months ago. Muchas gracias to our friends for clueing us in and helping us find this place! 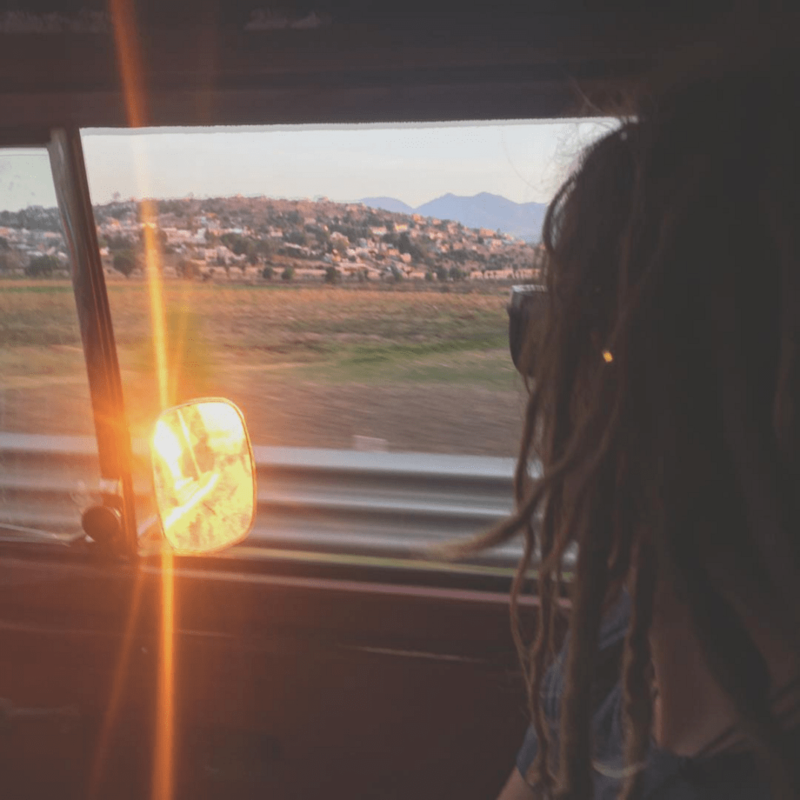 May, 2016, Guanajuato Though I don’t think they’ll necessarily remember all of the places we’ve gone, the hikes and the streets and the minutiae of their traveling childhoods, I like to think it will shape them as people in general. Still, I couldn’t help but imagine him at 25, grown up and his own man on his own adventures, wondering why this place seemed so familiar. May, 2016, San Miguel de Allende Like just about everything in Mexico, I am imperfect. I sag at the seams and get hot under pressure, I get lost and get sloppy and even the bags under my eyes have holes in them. But I’d also like to think that, like the dilapidation that is this nation, it’s all a testament to how you can’t get anywhere without a little wear and tear. 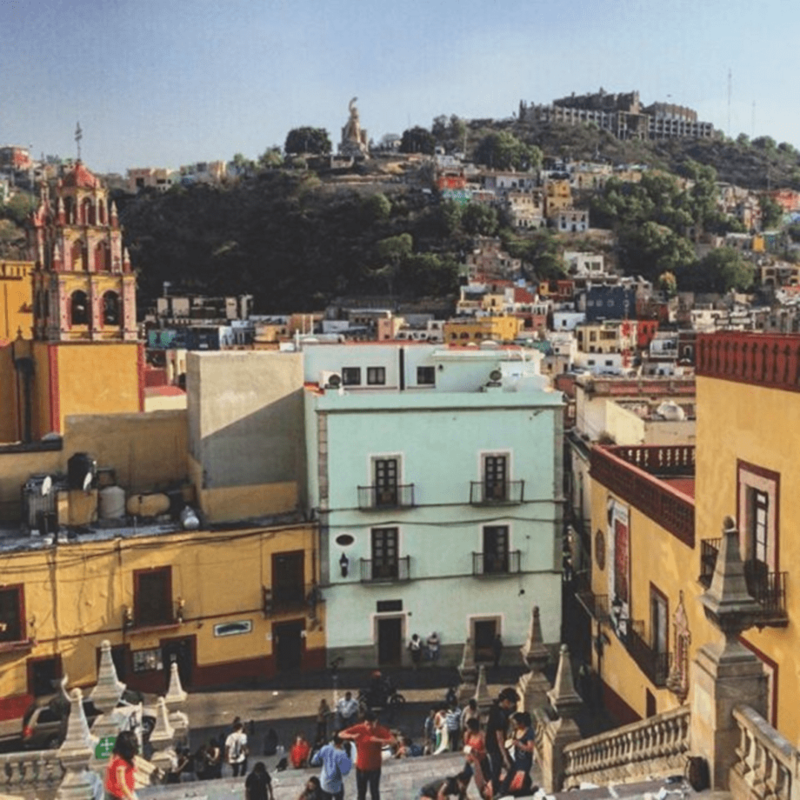 For us, San Miguel de Allende is just about perfection as far as cities go. Craft beer and great restaurants in abundance. Narrow cobblestone streets, many of which are closed to vehicles. A fair share of tourists, but we’re the only ones who seem to not speak fluent Spanish. And (like much of Mexico this far), I can’t help but laugh at remembering how the hippest places in the U.S. pay big money to achieve a look for their buildings that is simply the natural state of decay here. Note that Renée’s head is dangerously close to some live wires protruding from that building, a “feature” all structures on this street seem to have. 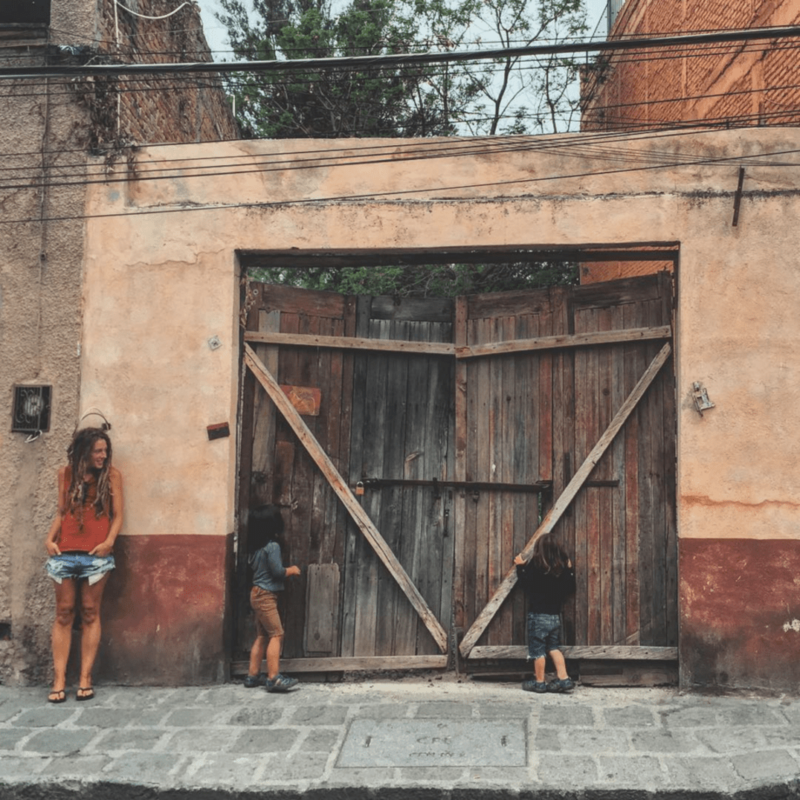 May, 2016, San Miguel de Allende On your mark, get set…slow! The days have grown longer, and the nights are cool here in San Miguel de Allende. It rains a little every few days and then the sun comes back out. Tristan and I can practice our Spanish on the patient locals and we’re getting lots of work and play done. I love it here so much, if MX’s government would let us, I’d stay for a month! 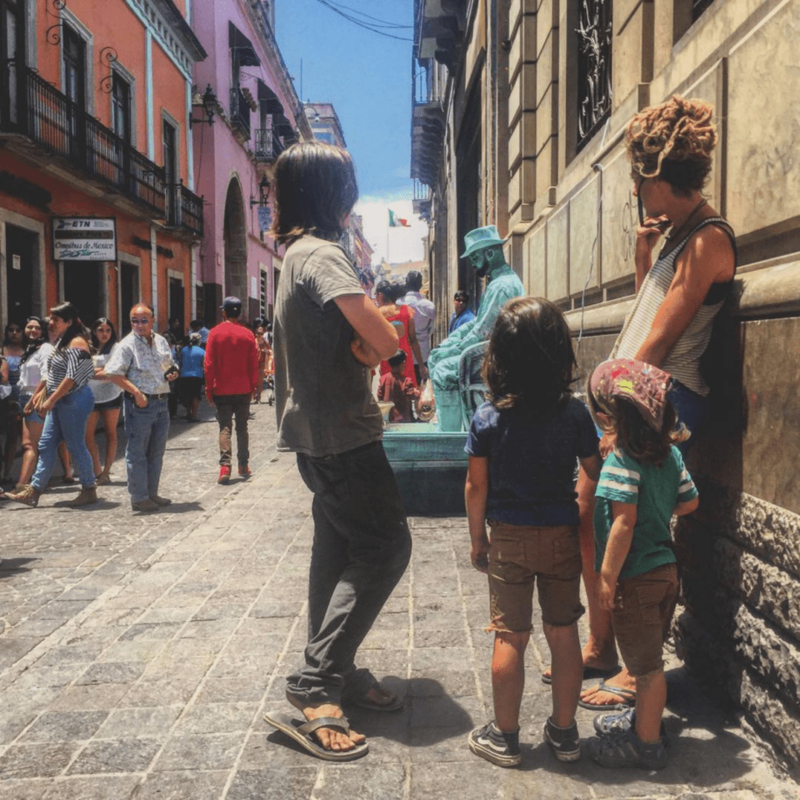 May, 2016, Somewhere in Mexico We somewhat reluctantly left San Miguel de Allende this morning because, you know, we’re travelers and so that’s sort of what we do. All was going well, listening to the new @hwamericans record and enjoying the scenery until we stop for gas. Turns out we’ve got a loose clamp but I thought it was a hole in the tank. Still not 100% on what it is or was, but we followed a guy to his taller de mecánico (which is just his house but he’s painted “mecánico” on the outside). He thinks it’s coming from a little chip in our fuel filter. I doubt it but he replaces it anyway. And we’re back on down the road. For all of 2 kilometers before the bus loses power. Luckily, just about everyone around here has painted the word “mecánico” on their house. Unluckily, I’ve got about 47 pesos left in cash. So I start at it myself, replacing this and that and looking my engine over like a penguin that wishes he could fly. The mecánico and his son come out. I tell them I have no money. They don’t seem to mind and start helping anyway. Tristan and I do more than just manage to speak Spanish with them, we actually do. Several hours later and a new fuel pump (that wasn’t the problem) and largely rebuilt distributor later and we’re waving goodbye, crossing our fingers as we head back on down the road and literally into the sunset. Well, you know how they say you shouldn’t drive in Mexico at night? Turns out it’s not just a warning, it’s the law. I’m scrambling for change to pay a toll booth operator and a cop notices we’re from Texas (we’re not). He asks me for my tourist permit. I play dumb like I don’t know any Spanish, as sometimes that works. He shows me a book of rules, the one of interest to this situation stating that foreigners are absolutely not permitted to drive at night. Awkwardly, I bust out my Spanish and explain to him all about our long day, that my family and I are headed straight to a campground, and of our engine troubles. And then he does something that pulled the whole day together. He shakes my hand and waves me on down the road. Finally, a little adventure here in the mainland! 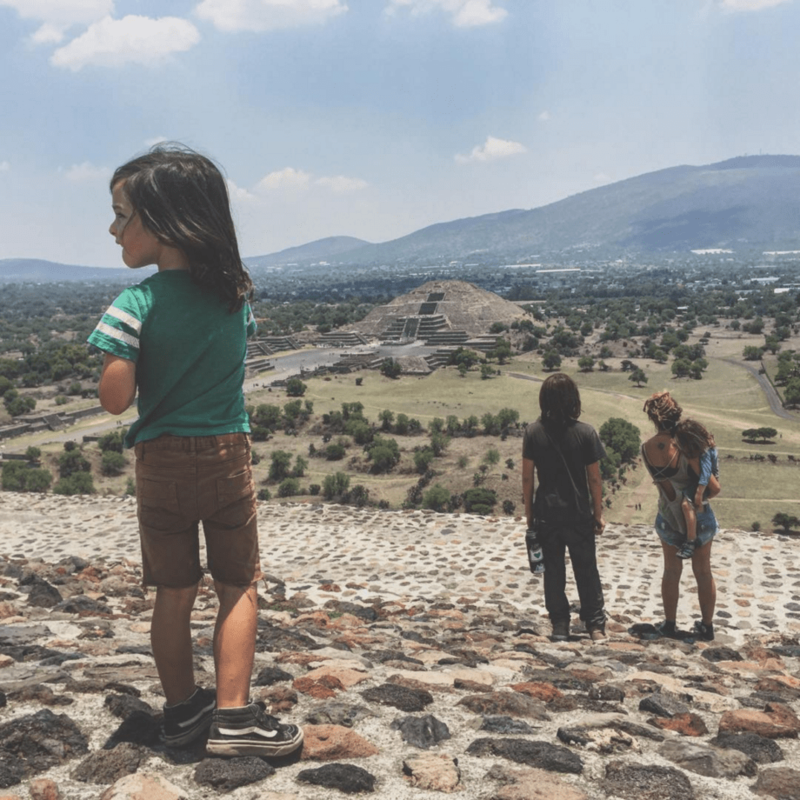 June, 2016, Pyramid of the Sun You know that kid that, when everyone else agrees on burgers, he wants pizza? And then after you order three pizzas, says he doesn’t like pizza? That kid who finds snarling, sticking his finger in your face and screaming to be an appropriate supplement to “I don’t want to do that”. The kid who just seems to wake up wanting to say f*ck the world and everyone in it, no matter how beautiful said world or nearby inhabitants seem to be? That kid was me. And this kid on the left here, our dear Winter, seems to be a chip off the old shoulder block. Sometimes it’s enough to make me want to snarl, stick my finger in his face and scream at him. And yada yada some big pyramid in Mexico. June, 2016, Somewhere in Mexico Our spare tire pointed west as we fled the hustle and kerfuffle of greater Mexico City, we were almost immediately thrown into a landscape of rolling farms and so many signs for pyramids that I began to think every mountain was another towering ruin of some previous civilization. The Bus was running like a champ. The air was crisp, floating in through our open windows like an air conditioner set to perfect. Two national parks were en route, and thank god the weekend is four days long! 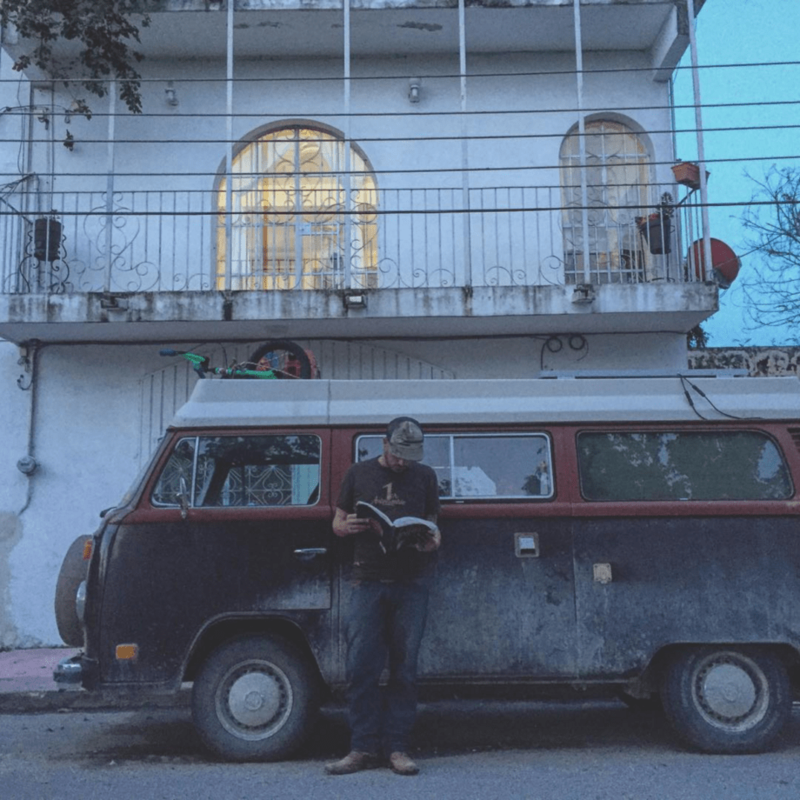 June, 2016, Perote “Just back up and fwwt!” he says. He’s an old Mexican man and perhaps the park ranger here at Perote, a big ol’ volcano in the middle of Mexico with an old growth forest that rivals anything the Pacific Northwest has left. “Fwwt,” being the universally known sound in Mexico for “just do it like this, it’s easy.” See the problem is, we can’t make this last thirty feet of incline. We can see the campground. The fire pits, the palapas, the endless vistas. We just can’t make it. Too many mountains. Too many four or five hour days. And not enough horsepower. He insists though. And my brain is spinning. I try backing her up the hill. Nothing. No power. Nada. I try a running start, but it’s all incline and no flat. Like trying to keep a marble rolling downhill on a pregnant woman’s stomach, there’s nowhere but peaks and troughs. He laughs all the while. We tell one another jokes in separate languages and though neither of us knows what the other is saying, we’re both cracking up. He waves goodbye. Now, typically Mexicans seem to love the chance to solve a problem like this. But the ranger just left. A couple comes coasting down the hill on a scooter. It won’t start and they’re just happy to be headed downhill. A guy comes by on a donkey. I figure that might do the job, but apparently he doesn’t share that inclination. Then another guy and his flock of sheep. Turns out I don’t have enough rope to for a sheepsled. Finally, about an hour and two later, Tristan and I figure out this “go ten feet, chalk it, repeat” method. I highly recommend it now, by the way. Just don’t value your fingers too much and you’ll be good to go. But anyway, hooray! We make it! 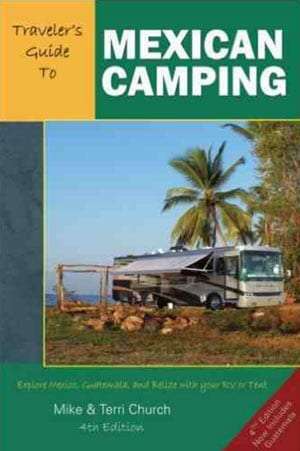 Though sites like iOverlander are more up to date, and we’re currently working with Campendium to get more Mexican campgrounds in their database, it’s the Church & Church Guide that does the job best for us when the going gets tough. Completely independent of WiFi, this odd collection of bounded paper (they call it a book?!) is a great way to find a new place to explore. 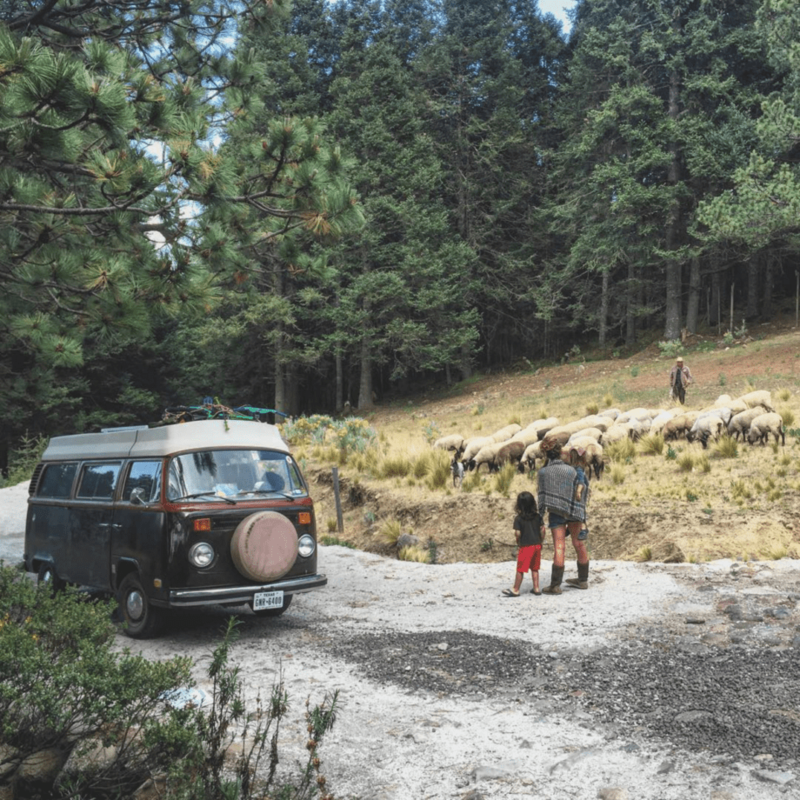 June, 2016, Perote He popped out of an RV that took me a minute to understand, as it was some Frankenwagon VWBus—the same old hippie sort from the 70’s as we have—but with the entire back replaced with a Class C camper. They made these buses in various places down here until a few years ago. Though the Bus part looked newish, the camper shell was decades old. “Made in Mexico,” he said. New bus, old camper, timeless Mexican ingenuity. “How far do you go,” he asked, “before you shift into 4?” I was a bit baffled. His English was ok, but the question strange. “I go as far as I need to,” I answered. “Maybe 2 hours…” To me, it was the correct answer, but now it was his turn to be baffled. He continued to ask more questions. “I use 3 quarts of oil,” and “we came from Guanajuato.” These were the things I said to him as it became more and more obvious he couldn’t speak English, but had practiced his opening statement well beforehand. I’m well acquainted with the trick. Practice a lines beforehand and see how it goes from there. We talked shop and travel. He gave me his number to text him a picture of some schematic stuff. Then he told me if we were ever in Leon, we could stay in his driveway. Nice. Maybe we would be. And maybe we will. Then he asked to see my dipstick and opened the engine up, with a sort of “is this alright?” motion. He took the dipstick and we walked back to his Bus. He reached into his engine and pulled his own dipstick out to compare. Stuff guys do, I guess. “La misma,” he said, “See, they’re the same.” We talked a little shop, but then I had to run. “I’ll do it,” he offered, “you go.” He left two days later. We left a week later. I went to fire up the Bus, which involves checking a few lights and the oil. Something was wrong. The dipstick was loose. Just writhing around, spinning in the hole like a stripper on a pole that isn’t quite experienced enough for her talents. We’ve had trouble ever since. Related? Unlikely, but I’m sure of it. He probably isn’t expecting us to show up in Leon, but when we do, aside from the whole dipstick chat we’ll need to have, we’ve got at least a week in his driveway. June, 2016, Somewhere in Mexico I’ve replaced everything from the fuel pump to sensors to spark plugs. Compression checks and timing and then double check and replace stuff again. Things seem fine, until they aren’t. So it’s another night in a hotel and our VWBus parked at some garage where despite their best efforts (and more or less just doing everything I’ve already done), the mechanics couldn’t get us back on the road today. Tomorrow, they say. 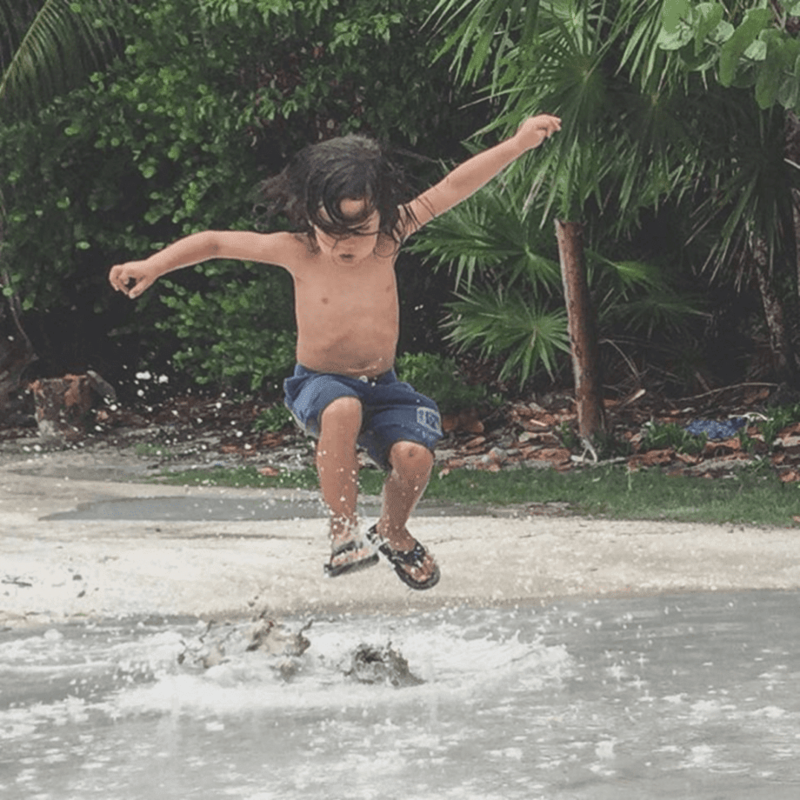 The right attitude is “it’s all part of the adventure” and some may look at a night in a hotel room full of air conditioning as a sweet respite from our typical life in a home / car with little climate control whatsoever. I guess I’m just feeling a bit more like actually adventuring instead of whatever part of the adventure this apparently is. Tonight though, everyone in my family surprised me. Tristan rode with the mechanic as he literally pushed us back to his garage with his car, my oldest son smiling all the way. Winter shared a toy with his brother, who then peacefully gave it back. And Renée, well she is the glue holding it all together lately. Difficulty seems to make my family rise above in a way we just can’t be bothered with in the day to day easy of our more typical days. I love you guys, adventure on! 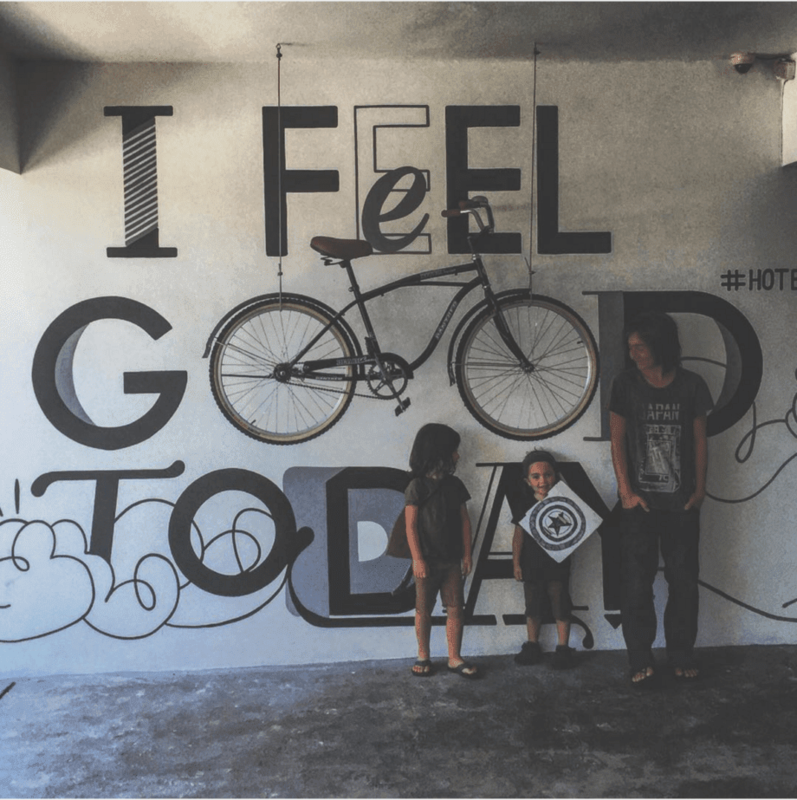 June, 2016, Chetumal …and I fully intend to tomorrow as well. 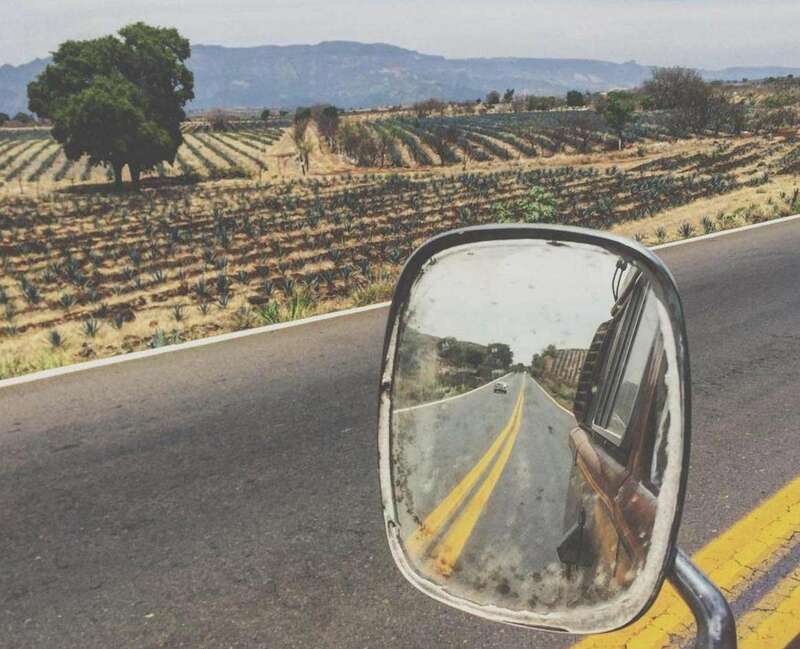 Life is indeed a highway and I’ve been riding it for too many nights, so many that at times the notion of how good we have it is sometimes lost on me. It’s easy to take things for granted when they’re the norm, but with a belly full of jalapeños and steak, a Carribean Sea sprawled out before me and enough family in my rear view mirror to fill a lifetime, I’m making a pledge to do whatever I can to keep feeling good, even when I’m bluer than the water here. 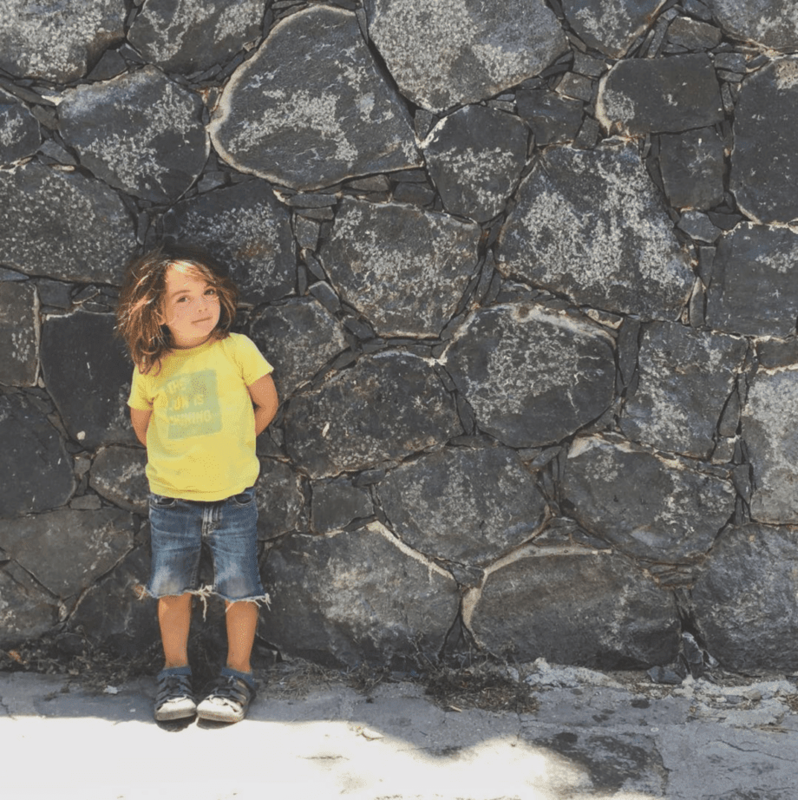 June, 2016, Bacalar What is a parent’s responsibility? To keep our children safe and fed? Maybe a roof over their heads and suitable clothing for the season? If we were wild animals, I would probably eat them. And their mama might take a few years before sending them off on their own to figure the rest out. But we’re not. We’ve all largely agreed that we should take care of our kids for around 18 years and even well after that if they need it. Most parents want their kids to do better than they did, to be more than we are. We want that, too. I imagine a future where we meet up with our grown children and their families all over the world. Grand babies who may not even speak English, or have been born as US citizens. Maybe they’ll be rangers or cartographers or astronauts. Or maybe they’ll be bartenders and web designers and all flock back from wherever they end up to wherever our old bones find it most adequate to rest. Here’s to all of the parents who empower their children to have dreams and let them chase those dreams whether they look like the ones we envisioned or not. June, 2016, Belize “Semana después semana, más y más problemas,” I told the mecanico. The 6th one in two weeks. “Week after week, more and more problems,” being the English translation. “I never let anyone do anything to my Bus,” a friend told me, “it will just make things worse.” He’s right, and now I know why. I’ve spent countless hours doing tune ups, reading manuals, fixing and breaking and tweaking and fixing again. I’ve learned more than I ever imagined I’d know. 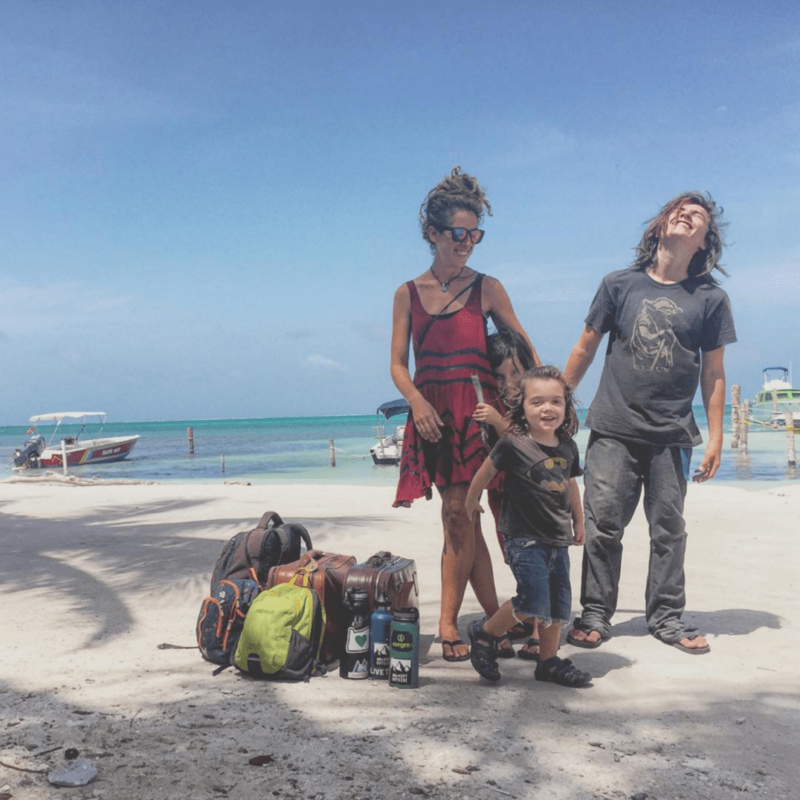 We rented a house for a week in Chetumal, MX. A very non-touristy place. We made a friend. She helped us tremendously by translating all of the nuances I can’t convey or understand when speaking with mechanics. She lead me from one to another until she was satisfied they knew WTF they were talking about. “Week after week…”, I kept telling him. He rattled something back at me. I didn’t understand. Our new friend translated. “When you leave here today, you will have no more problems,” he said. He walked me through everything. What was our problem for the last few weeks? 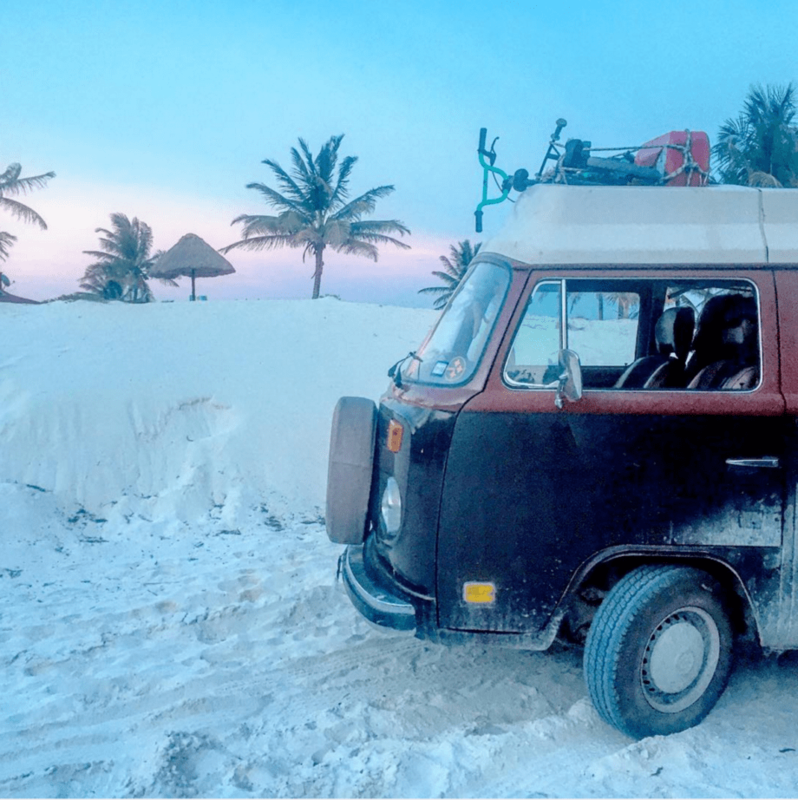 Well, despite a new just about everything, it seems that not all mechanics are created equal, even down here in Mexico, where “Kombis” are common. So sometime between me doing a full tune up and last week, the five guys who worked on her screwed up the timing, replaced the spark plugs with the wrong ones, and more or less just undid what I and each of them in turn were attempting. I remember watching all of them repeat the same procedures one after another. None would listen to me. And frankly, I was likely speaking a foreign language. And they were the pros. What have I learned? That it’s ridiculously important to have more than just a basic understanding of how these old mujeres work. It’s essential. As our new friend and I drove home, a full two days worth of her time driving from parts store to parts store, mechanic to mechanic, I realized how important it is to rely on others for help every now and then. So how to know who to rely on and who to dismiss politely? That’s the next big question. And with that, we’re in Belize! 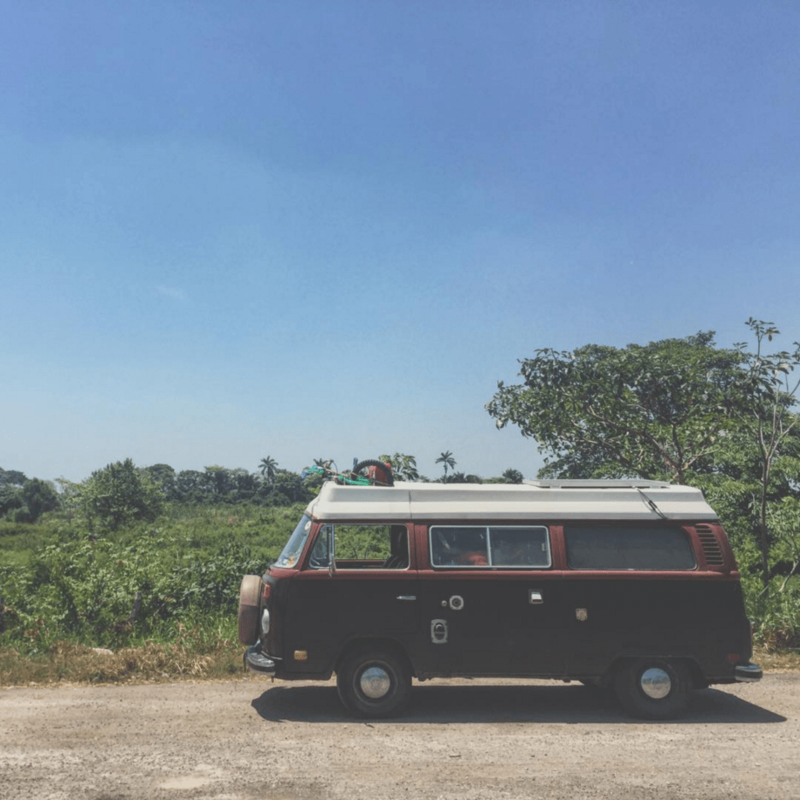 June, 2016, Sarteneja One of the nice things about traveling in the Bus is, wherever we drive, we’ve got all of our stuff. It’s not a lot of stuff. But it’s all of it. Island hopping, on the other hand, means suitcases and forgetting things and having all of your fruit and meat thrown in the garbage because I guess Belize just ain’t having no Mexican food. It also means hostels. Hostels where you meet an Australian guy who can’t open a beer without a bottle opener and doesn’t have a bottle opener. So there he is, basically standing upside down in the wrong hemisphere with a beer and no way to open it. So I show him the lighter trick. “You can do that, huh?” he says to me, clearly unimpressed, before drinking his now open beer. “You can do it too!” I try and show him but he is more interested in other things, people and conversations. I go for a pee and then a smoke an hour later. I can’t find my lighter. I look everywhere. “Looking for your lighter, dad?” Tristan asks me. 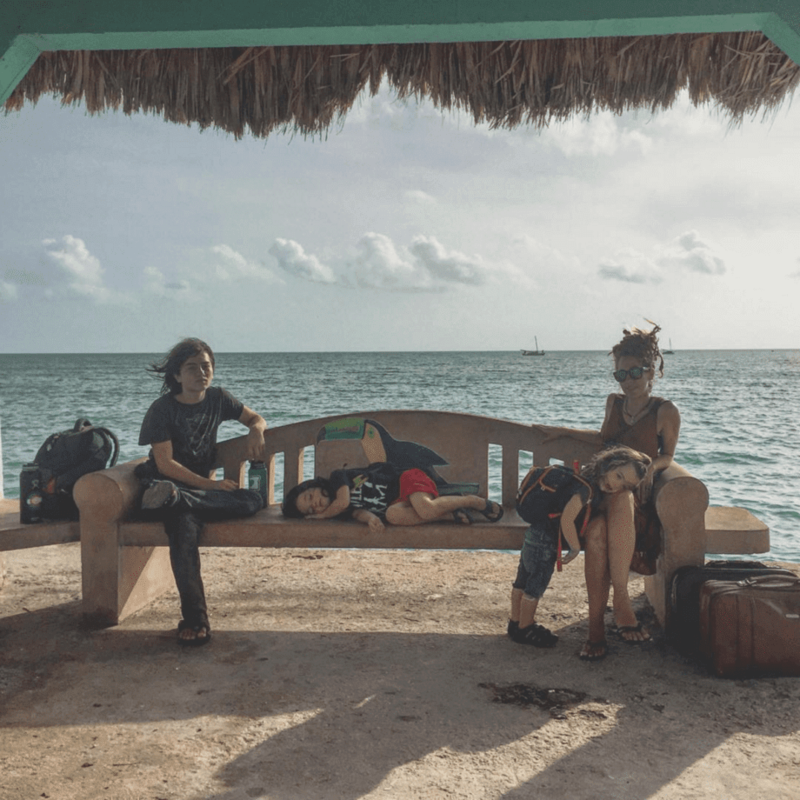 June, 2016, Caye Caulker, Belize Though our Bus is now running in tip top shape, we’re still a little mad at her for the past month or so. Sure, it’s not her fault, but every good parent knows that you should punish your children whether they’re actually wrong or not. 🙂 So what do you do when you tuck your Bus away for storage and have no way to get around? Boats, feet and suitcases! We’ll be island hopping for the week’s duration of timeouts and after only a morning of this I can already say that I’m beyond satisfied. June, 2016, Belize The rainy season. It’s like a free shower every time you take a walk. 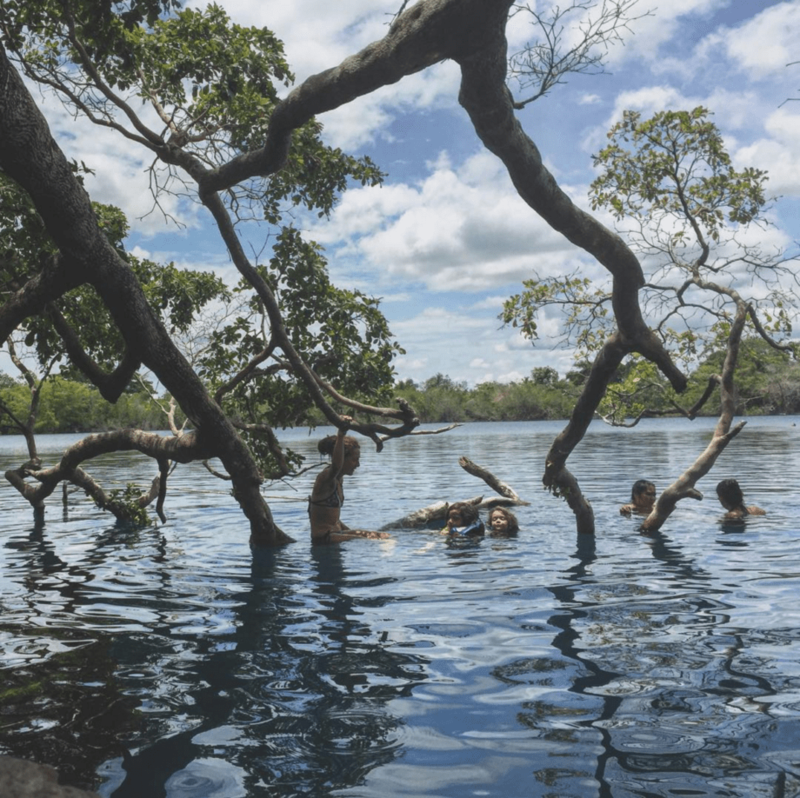 The wind whistles ghostly all nighters through mangroves while nocturnal crabs beat their claws against their chests like the rastas down the street thump primordial grunts as they do their thing in front of bars packed with wasted tourist kids and locals alike. We should be on a ferry headed somewhere but mudpuddles and mimosas sounded like a better idea on a Saturday in Belize. June, 2016, Belize “Que pasa, cowboy?” They were two island guys, skin as tan as burnt leather and eyes red like the 20th of April. “Hahah,” they didn’t laugh, they said exactly that, I guess imagine a Jamaican accent is as best I can describe it. “Be good, Texas.” Then they rattled off a few more words in Creole and had a real, a good laugh. At my expense no doubt. I was left with the following thoughts on how to learn Spanish (and this is my official six month course). Phase 1. 3 months of intensive fish tacos in Baja. 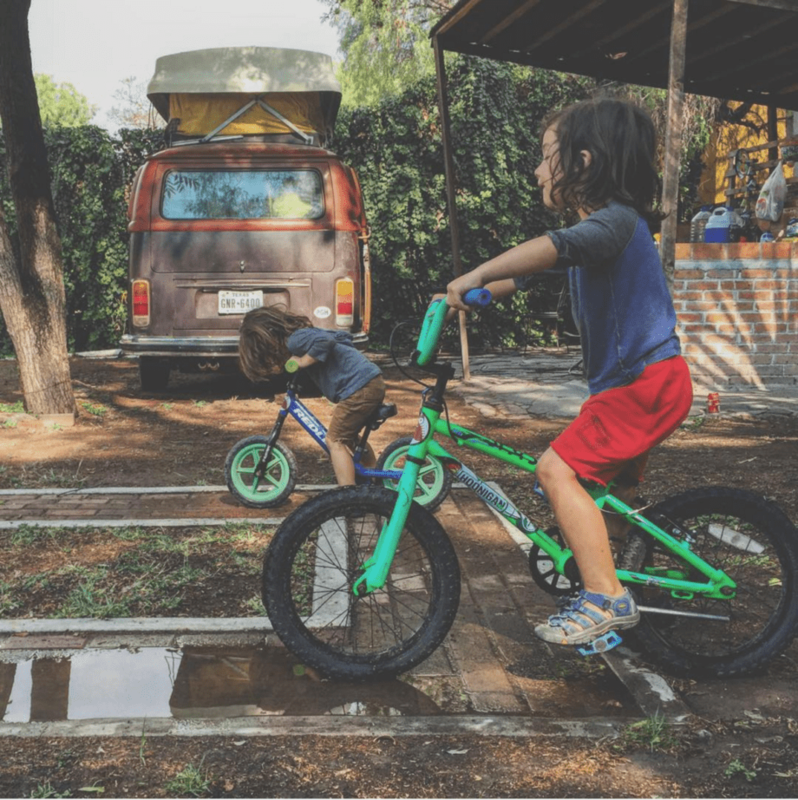 This will teach you the basic pronouns, how to ask for necessities like food, shelter and beer, and if you’re lucky you’ll learn a little about traveling and car parts along the way. Phase 2. duolingo. Every single day. Seriously, it is just vastly superior to Rosetta stoner. Phase 3. Drinking in moderation all day. Three beers in and I’m gung-ho speaking to everyone I can. And it hurts less when you fail completely. 6 drinks is even better. Come #9, go home and start fresh in la mañana. Phase 4. Belize! You can lead with Spanish, but if you screw up they all know English too! And by this point (6 months in or so), you should be good enough to know a little of what they’re saying when they all giggle something about Americanos. Unless they go all Creole on you. Then just pretend like you speak German I guess. Or fake a Brooklyn accent. 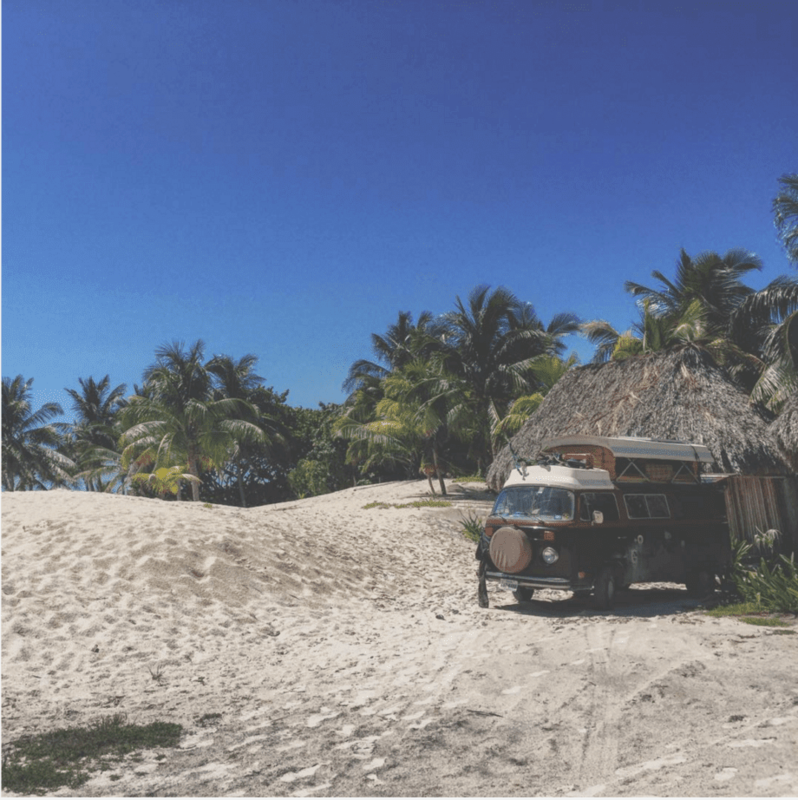 June, 2016, Dreaming… Toes in the sand, umbrellas in your drink and hopping from one tropical paradise to another ain’t so bad…but give me a busted up Bus full of what little we need any day. Living in rentals is easy. Air conditioning. Fast WiFi. But I’ve worked more these past two weeks than in the entire two months before. Just reminds me that vanlife and the freedom from expenses it promises is the way to go, for me anyway. 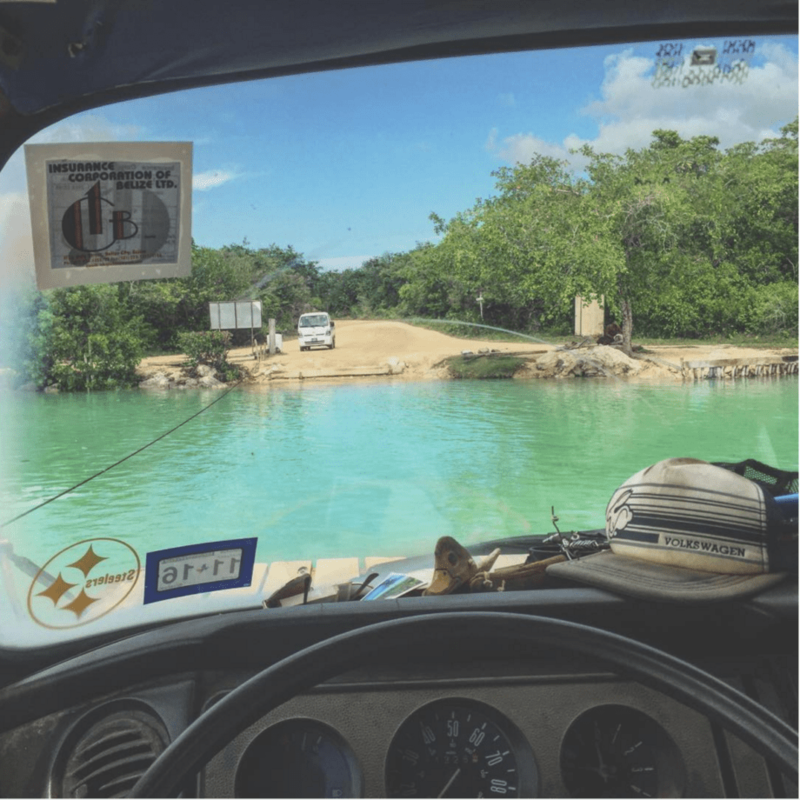 June, 2016, Sarteneja, Belize It’s dirty and hot and smells like a week in the rainforest without a bath…and it’s good to be home! 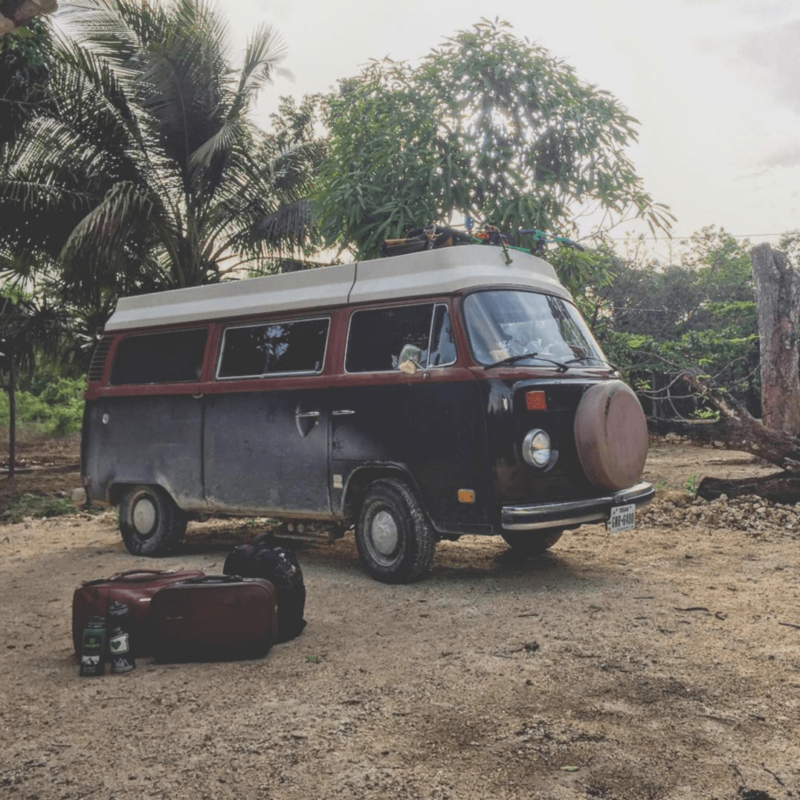 June, 2016, Orange Walk, Belize “Sorry, there’s no room at the inn,” he more or less told us as we once again left our beloved Bus in the hands of a stranger, suitcases in tow, the transmission now separating from the engine. The rooms were $35/night. The cabin $99. Options seemed limited. He drives us in a minivan down to a river. “Look at all of the egrets,” I say to the family behind me. 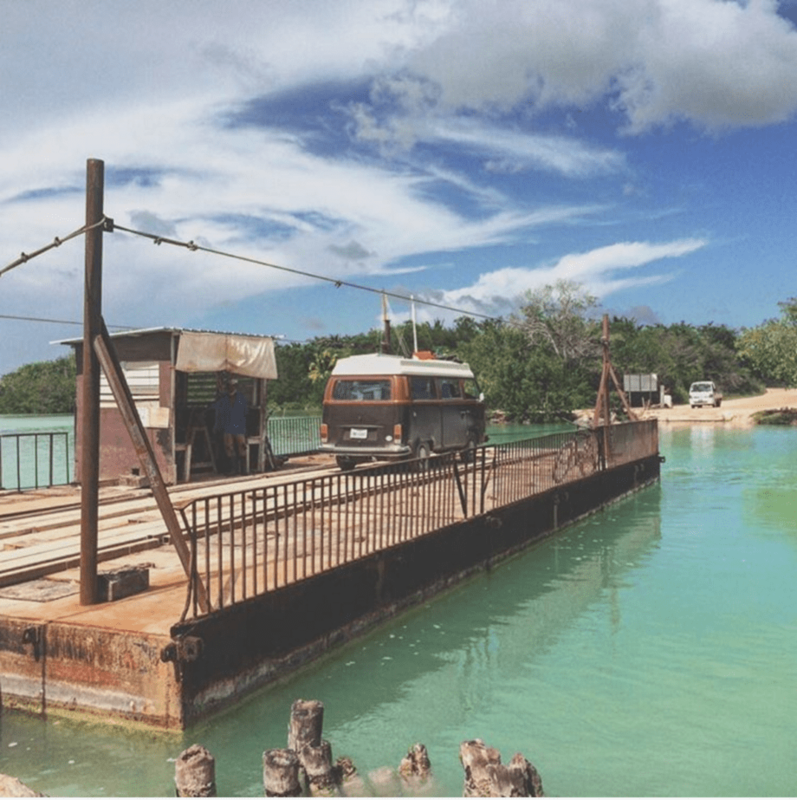 “Yes, Orange Walk is beautiful,” our driver/innkeeper says, “a local rum distillery releases chemicals into the water that force the fish to come up for air. 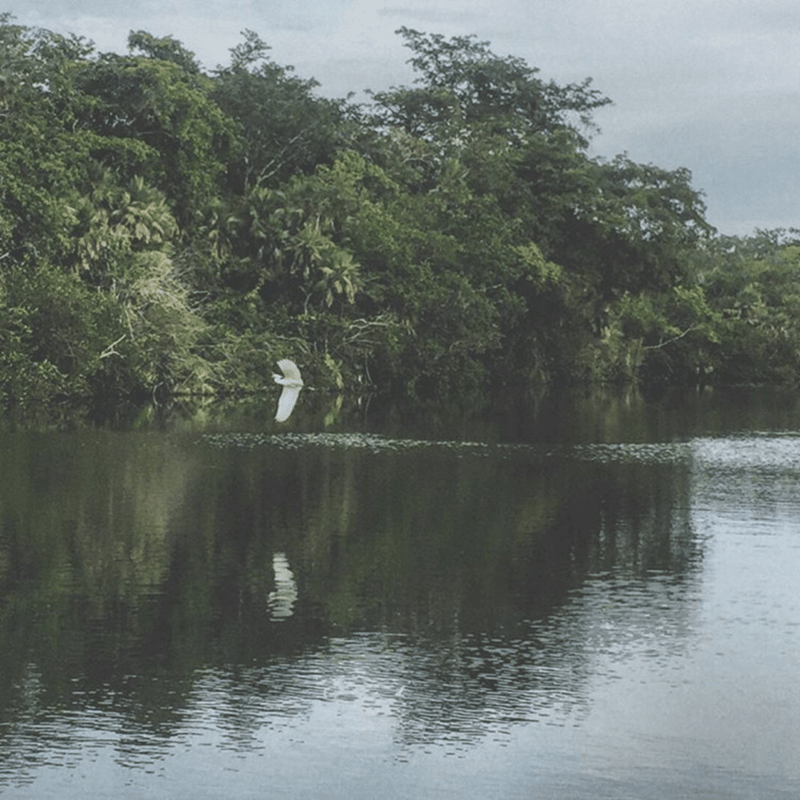 It makes for excellent birding.” And so we discover the true meaning of ecotourism in Belize. The next morning we wander into a restaurant for jerk chicken breakfast. “Where are you staying?” they ask. We tell them. 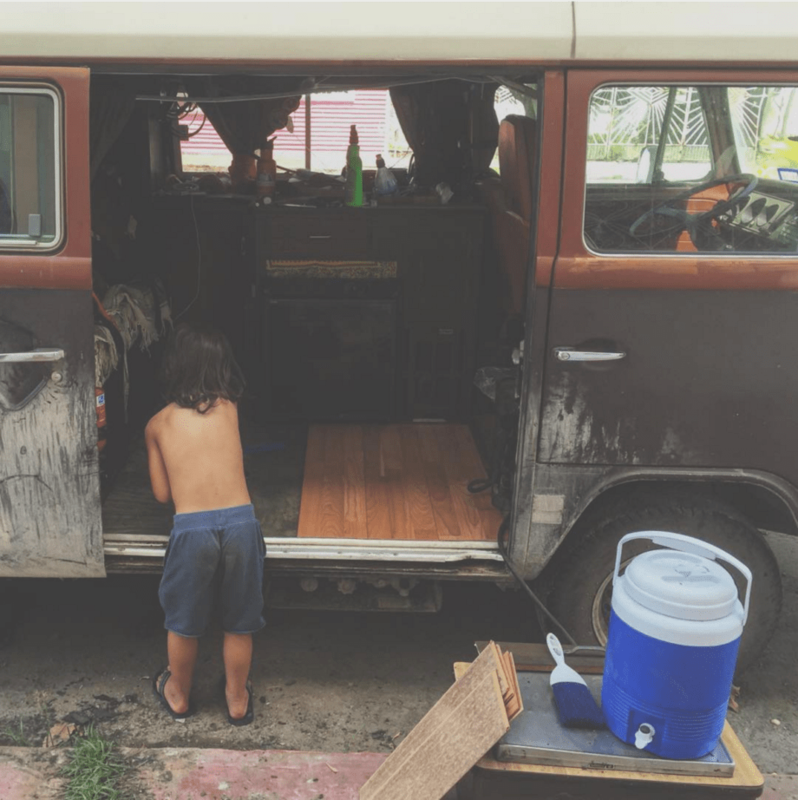 June, 2016, Orange Walk “How much did you pay for the Bus originally?” Tristan, my fourteen year old son who was there with me since I first gave up our original RV for this old pile of peace, love and rusty bolts. “$4000,” and we’ve probably got $20k more into her by now. New engine, solar system, new fridge, new tires, new everything. Almost. New starter is next. “When do you just end up buying a new one?” he asked. Good question, sunshine, good question. Renée asked me last night, despondent over the reality that our time in Belize would be cut short. “Yeah, I guess,” I wanted to imagine a scenario where we could prolong our return to Mexico, but despite my typical aptitude toward saying f* it and letting the ensuing pieces of Volkswagen fall where they may, the part we needed was in Chetumal, and nowhere in all of Belize. “So you just want to push it?” Dito asked me. Dito was the mechanic’s name. “Yep, all the way to the border,” I replied. Five Belizeans pushing and me behind the wheel, I dropped the shifter into second, turned the key and let off the clutch. “Thanks,” accompanied by a peace sign as I watched Dito and his boys wander back to their shop in my rear view mirror. 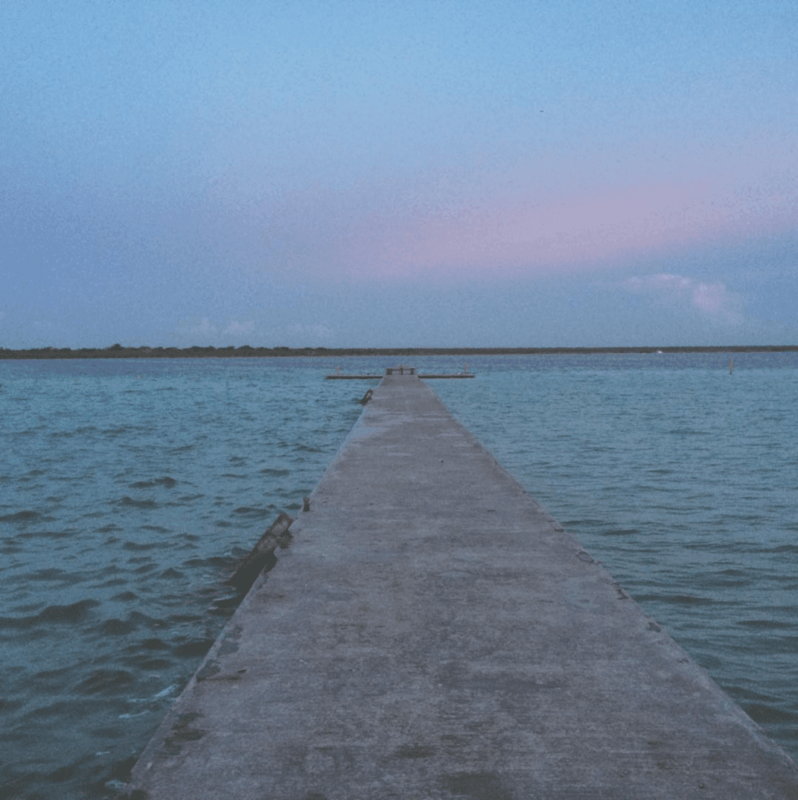 June, 2016, Chetumal I’m up at 5am, my brain racing like a chupacabra caught in a cockfight. “What if it’s the wrong part? !” These are my nightmares of late as I rush to the web to research part numbers. Yep, the guys at AutoZone here in Chetumal ordered a starter for an automatic transmission. I roll manual, of course. I hop in a cab and I’m back at AutoZone. “El parte no es correcto,” I tell one of the fellas, but he’s not having it. I brought my old starter. He looks at it, looks at his computer, looks at them both again. Yep, they don’t have it. “Necesito a cancelar mi orden.” “No es posible,” he says. I explain that I’ve already explained what vehicle I have. He explains that I’m going to have to wait. Out comes another guy who also tells me I need to wait. “Wait for Joaquin,” he says in Spanish. “Joaquin can help you,” he nods his head, “he’s at lunch.” Joaquin is apparently an ultimate food eating champion, because two hours later he’s still out. To his credit, getting the check at a Mexican restaurant is like waiting for GNR to get back together. Finally someone tells me I can have a refund…but I’ll need to wait an hour. June, 2016, Chetumal We’re living in a Maniac Mansion of a complex at the moment. It’s a half-finished sort of hotel in Chetumal that’s been under various stages of construction since 1998. Someday it will be boutique…or ruins. 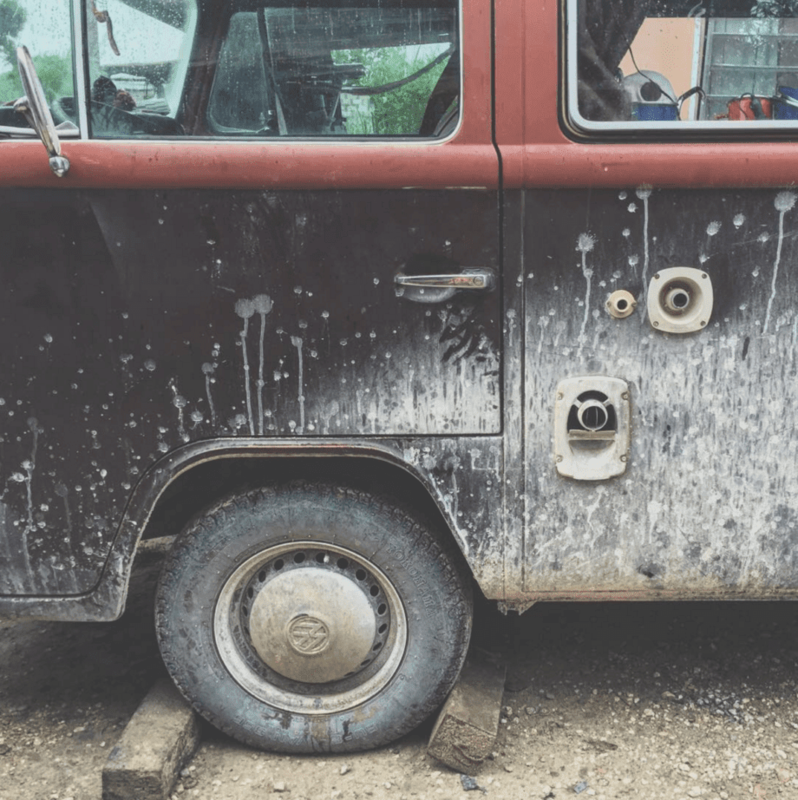 “Mine died,” he says to me, “but all carpenters are terrible around here… “…but,” he offers, “I have some plywood, and a saw.” He owns the place, the place where our VWBus is parked out front, currently surrounded by all of our rain-soaked camping gear, broken pieces of cabinetry and busted mechanical components strewn about the sidewalk. Belize was tough on the old girl. We’ve got a few days until our new starter arrives, and like he said, he’s got a saw and some plywood. He points to a nearly vertical ladder tied to another structure primarily composed of rebar and power tools, and pointing at it all, says, “you can use the workshop.” So Tristan and I spend the evening measuring twice, cutting once, sanding and staining. By the end of the next day, we’ve got all new cabinetry facings. 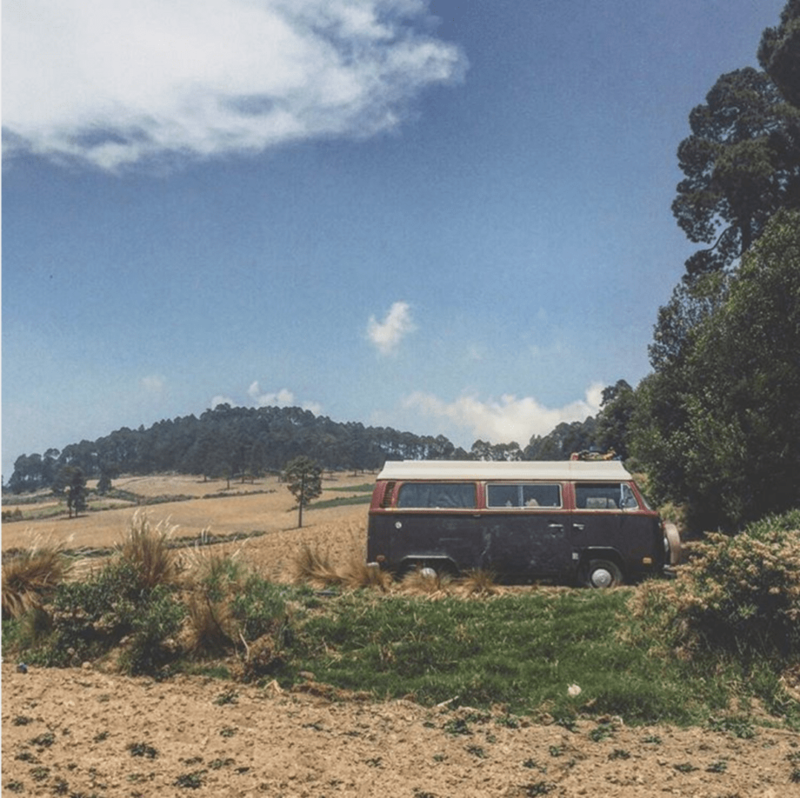 He’s given us use of his tools, a place to stay, and plenty of stories about things like the nine Volkswagen Buses he’s gone through in his own lifetime. We are essentially stuck here in Chetumal, for now, and so like every night here, Renée and I wrap up the evening smoking and drinking mimosas on a second story balcony. He appears from one of the many corridors and catacombs that comprise the building. Street lights cast a look to his face that reminds her of my dad. “Do you like to swim at night?” he asks. “Let me show you where the lights are.” If it weren’t for engine troubles we’d never have come to Chetumal. Or Orange Walk. Or a host of other towns which aren’t meant for tourists and therefor are as “real” as an experience of Mexico as you can get, I suppose. Summer has just begun and our plan wasn’t much more complicated than “hang around the Yucutan until Autumn”. We’re still waiting, but we’re not in a hurry. We’re still “on track” I guess. And sometimes that means you’ve got to pull over while the other trains go by. June, 2016, Chetumal While we wait for our arranque de motor to clear customs, we’ve decided to make a few updates to our beloved Champagne Edition’s interior. For a little background, that means she’s a “special edition” VWBus built in 1978 to clarify to the world that she’s somehow better than all other VWs. All it really means though is chrome bumpers and a brown dashboard instead of black. She’s also a Riviera, which means she’s not a Westfalia. Whatever. But this also means that by redoing her interior I am committing sacrilege, and the VW folks are happy to let me know it. The Mexican men who pass us on the street though (our “workshop” is the street), just want to join in the fun. “How much did you pay for that flooring?” and “Are you going to glue it down or nail it?” they ask, nearly every single one that pass us by. “Deba usar [insert suggestion]…” they recommend. I laugh, they get my ½ comprehension, laugh back. We fist bump. Old guys do fist bumps here in Chetumal. Rad. I love that about this country. Everyone is interested in projects. When replacing our fridge a few months back, I had three guys standing around watching me, giving me pointers, and one even lent a hand. Mexicans tend to have less to do than what we Americans figure is necessary. I get the impression that work here is more about fulfilling a specific need, not a specific need to prove that you can work harder and longer than anybody else. It’s right up my alley. So Winter scrapes clean our old carpeting’s insulation. I cut floorboards and install them. Tristan runs to the hardware store half a dozen times. 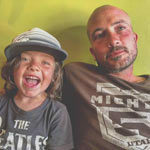 It’s a family affair and is one of the things I love most about this life we live. June, 2016, Chetumal “It was a true pleasure to meet you,” she said, shaking my hand and then going in for the hug, even though she was all dressed up to go out somewhere and I was a Mexican Summer’s worth of sweat and engine grease. She was the lovely woman who managed the room we’ve been renting on and off until we finally (fingers crossed!) got our Bus back to tip top. Little positive moments. They can add a few heartbeats to a person’s life. It’s easy to be negative. To get down on others and yourself. “Down” is as easy as it gets. Gravity itself implores us, todos los días, to be down. Everything wants to fall, and it takes a great deal of effort to rise above. Like, literally. Climbing stairs takes your breath. Flying took humans some millions of years to accomplish. It’s hard to get high, but damn, it sure feels better than being grounded. 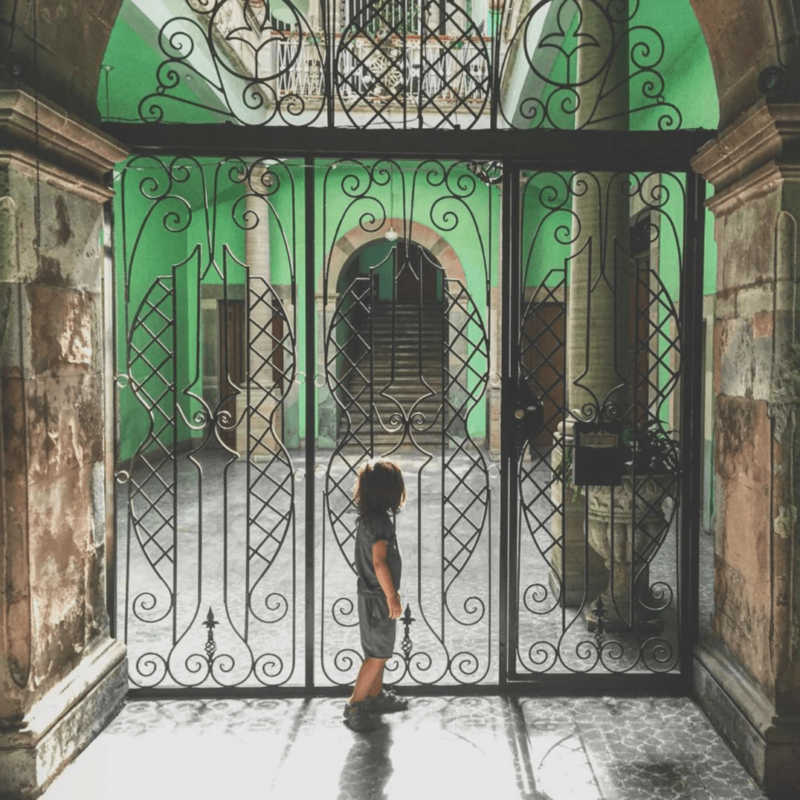 June, 2016, Chetumal “Do you need anything!” she asked me the other day as we were leaving our little flat in Chetumal. The owners of this place have already given us so much. A comfortable place to live for a moment. Clean sheets. A power saw and a workshop. Spanish translations. They’ve been wonderful, frankly. 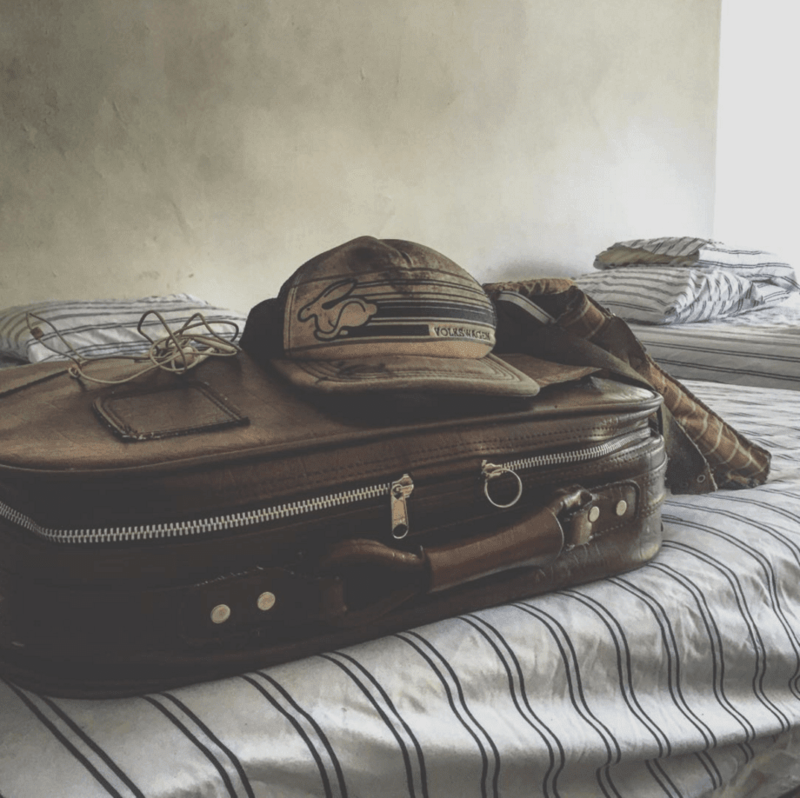 But though her question was possibly only a formality, I looked at my possessions on the bed just before we left and thought it over. I need food. I want cigarettes and beer. I need water. I need air and I suppose a safe place to sleep. I want to travel. Those are the true necessities. In general terms though, everything in this picture is all that I actually need. A hat to keep my head from getting poisoned by the sun. Some clothes to keep me out of jail and warm. A laptop to keep the money coming in. The headphones…well they snuck their way in to the picture. I want a family. I want a girlfriend. 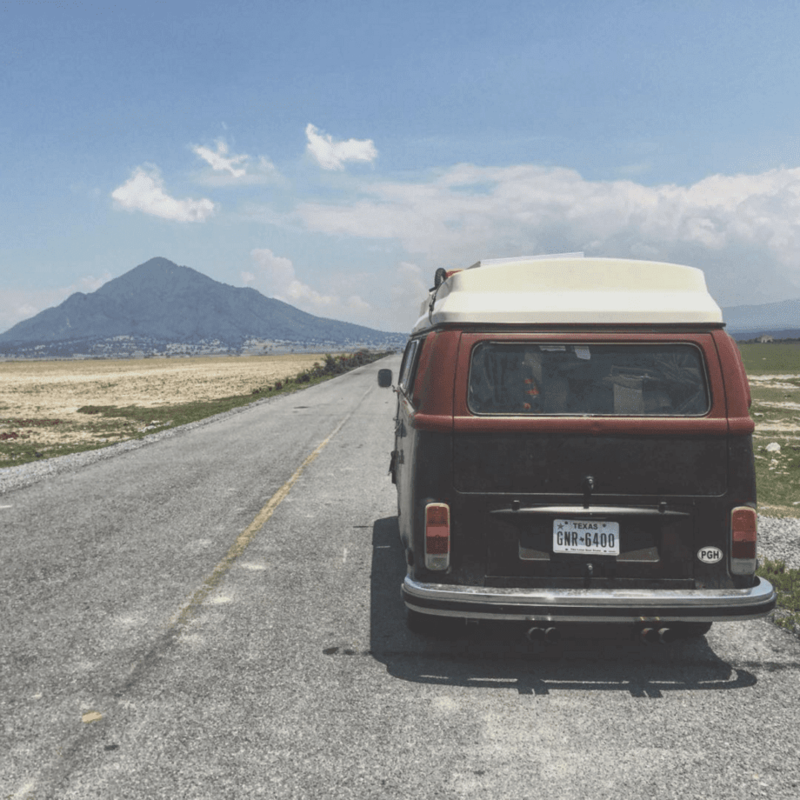 I want to travel and go out to eat and hang out with friends and I want to have a running VWBus. But do I need anything? 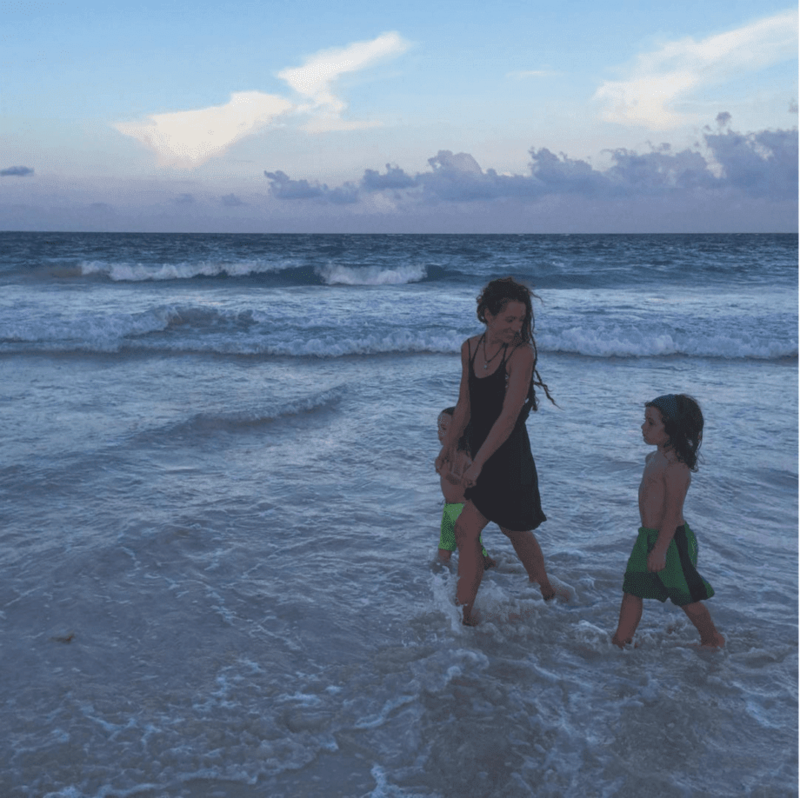 June, 2016, Tulum It’s early morning and we’re the lone family camping in our VW Bus on a beach near Tulum, surrounded by a small village of tent camping 20-somethings from around the world. Everyone is covered in a variety of shades of tan and long hair and dripping sweaty sexiness. The family has gone off to the beach for a morning swim. I’m sitting in a slice of shade working on some propane lines that were damaged recently. One of the tent campers appears from around the corner of the Bus. “¿Tiene un encendedor?” he asks, his hand a fist and flicking his thumb like he’s using a lighter. I procur a light from my pocket and hand it over to him. He pops a rolled cigarette into his mouth and lights it. “¿Tome marijuana?” he asks, his chest full of smoke and speaking through held breath. The fresh beach air mingles with the distinct scent of pot. He extends the joint toward me. I think of the words in Spanish for my reply as I shake my head and hand to indicate “No thank you.” “Quiero mi cabeza estar clara,” I say in my slow brand of Spanish, “I wanna keep my head clear,” I repeat in English. He takes another big puff as he laughs a little and I chuckle too, thinking that the way I speak Spanish–long pauses between words as my head translates everything for me–that I probably sound stoned already anyway. He goes off to splash in the ocean with bloodshot eyes. I go back to fitting copper tubing in the hot sun with a clear head. Everyone has their own brand of traveling, I think. June, 2016, Tulum “De donde eres?” a man asks me as he turns on the water for the outside showers near the only place in Tulum we can find a place to camp. “Where are you from?” is the English translation. It’s an interesting question and one we get asked all of the time. 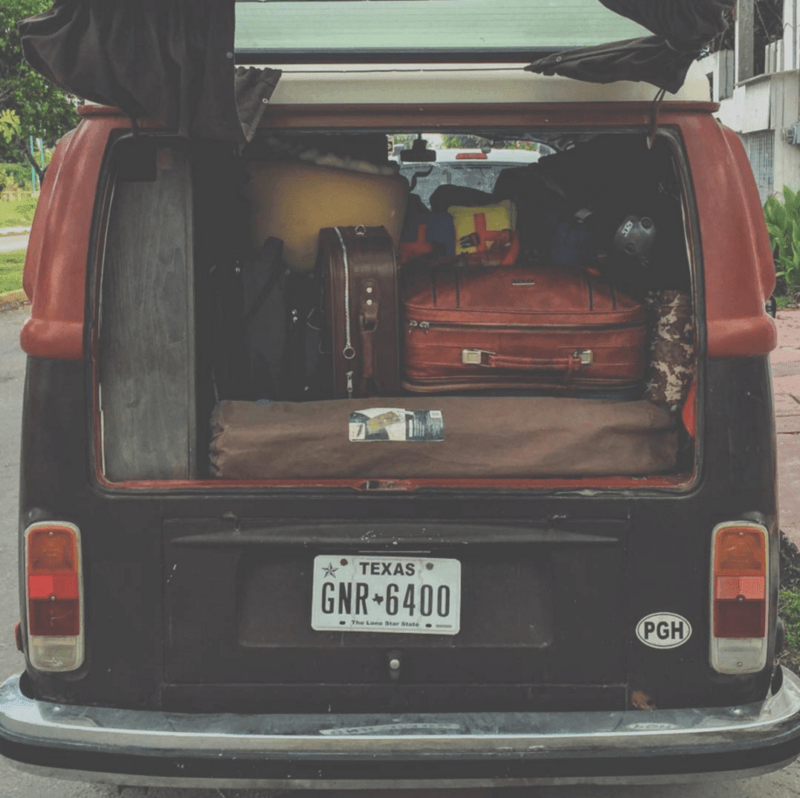 Usually I figure most people don’t want the full story, but as I give him the shorthand, “Pennsylvania,” he looks across the parking lot to our VW Bus and simply says, “Tejas?” Yeah, our license plates say Texas. I was born in Pennsylvania, and Tristan in Pittsburgh, which is where I met Renée, who is from Michigan. I bought our Bus in Colorado and that’s where Renée lived when T and I managed to convince her to join us in this life. Our younger boys were born in Oregon and North Carolina. June, 2016, Tulum “Isn’t it hot in that thing?” he asks, just another tourist eyeing up the Bus on his way to wherever. “Yeah,” I shrug my shoulders. It is hot. Yesterday I even felt a little sick from it. I don’t think about it and I don’t let it bother me. What would be the point? But we didn’t build this life on shrugged shoulders. 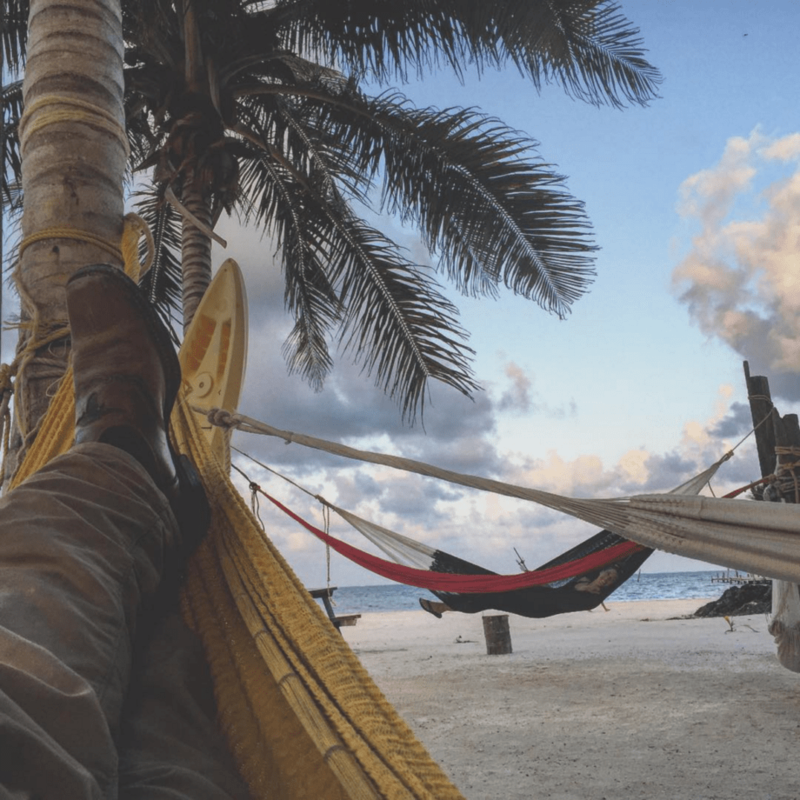 So we make plans… There is exactly one spot in Tulum where you can park a vehicle and camp near enough the water to score the ocean breeze. We’ve been in it every night. 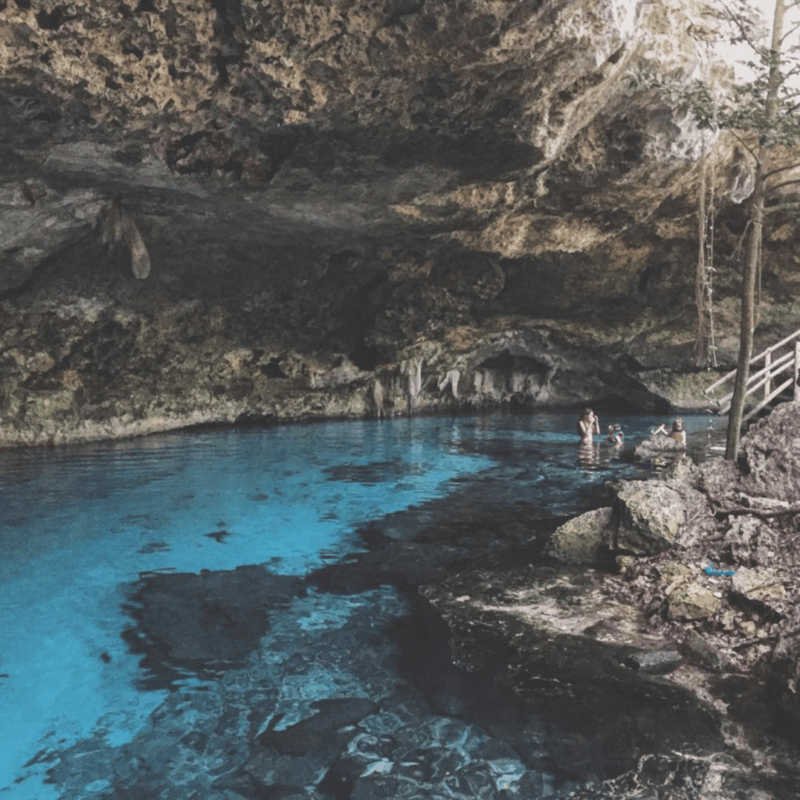 Cenotes are more than just caves full of pristine, filtered, freshwater. They’re magic potions where the frigid liquid soaks right into your soul and turns your blood into a central air conditioning unit that lasts an hour or so after you leave. It can be tough to sleep in the midday heat, but I’ve found that adding six parts mimosa to one part me and allowing it all to mix in a hammock for about two hours to be the perfect recipe for a siesta. June, 2016, Tulum “Did you find the place?” he texts me via AirBNB. We’ve been in Mexico for exactly 180 days tomorrow, if you don’t count our misadventure for a week in Belize. What’s it like? What have we learned? And why are we here if it’s so damn hot? Aside from what I presume is obvious, fish tacos are prevalent, they speak Spanish, and everything is ridiculously cheap…a few things come to mind that aren’t as known in the US. As you know, we break down often. I have yet to find a single Mexican man who will pass a struggling family on the side of the road without offering help. Contrast that to the US? I’ve never met a single American man who has ever once stopped to see if we’re okay. Policemen have giant rifles on them nearly at all times. They will stop you and search your vehicle. They are incredibly polite and I don’t believe the concept of frisking exists. There are pine forests in snow covered mountains, even into the early summer. I don’t know the facts on this, but it certainly seems that vastly more Mexicans know English than Americans know Spanish (or any second language). Learning a second language is hard. Being a relatively poor man living far from a tourist town and yet still being bilingual is amazing. It’s not about making a buck. Twenty pesos goes a very long way though. Americans all too often refer to Mexicans as lazy. It’s an hilarious notion. They do the toughest jobs for the smallest pay checks in the US, but here the concept of work seems very different. Work seems to be more about needing the basics rather than wanting it all. That said, there are beautiful things here that have been salvaged instead of replaced, created instead of purchased. 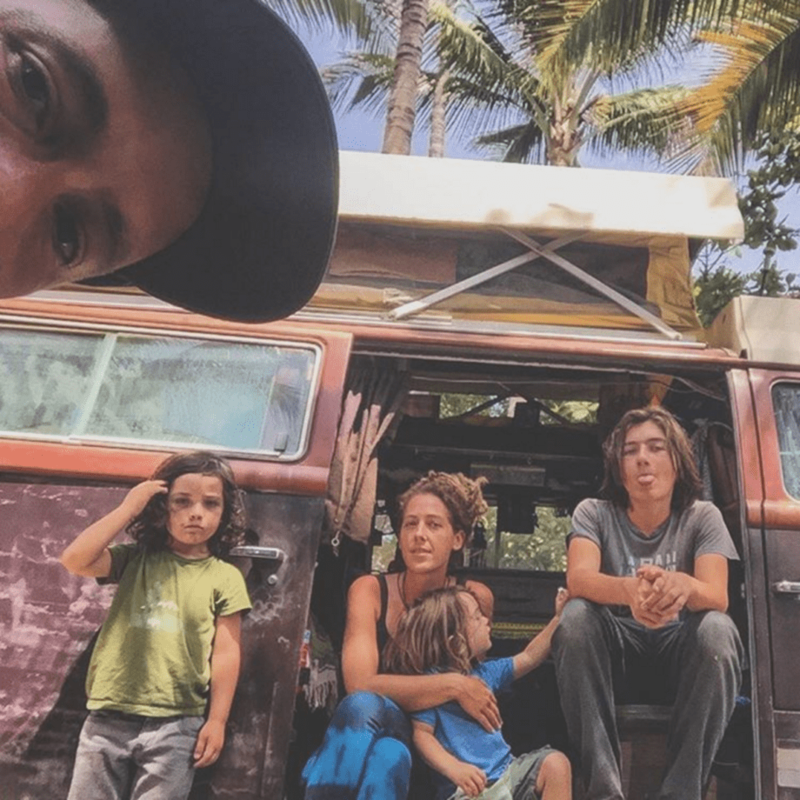 So to answer his question, “Yeah, we’ve found the place, alright.” And while we don’t love everything about this hot desert and jungle full of endless similar restaurant menus…we want to stay because we’re here and it’s a beautiful thing. We’ll have all of our lives to explore the US more, to cross oceans and borders, but a year in Mexico is something we’re doing now. “Ok, let me know if you need anything!” And you know what? He truly, actually means it.